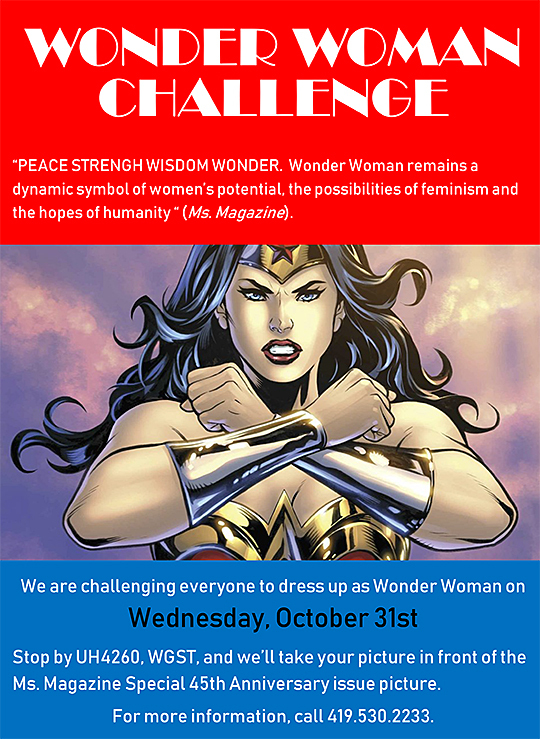 Break out the metal cuffs and red, white and blue attire: The Wonder Woman Challenge will take place Wednesday, Oct. 31. Linda Curtis, secretary 2 in the Department of Women’s and Gender Studies, was showing a poster of that special issue cover to her friend, Jeannie Stambaugh, secretary 2 in the Department of Economics. “We decided that saying, ‘Resisting Persisting,’ really represented us well, and we came up with the idea of dressing up as Wonder Woman on Halloween,” Curtis said. “We were being silly, having some fun, and focusing on the positive while doing our jobs,” Stambaugh said. The two shared the concept with other secretaries in the College of Arts and Letters, and they accepted the challenge. “Jeannie and I felt that the Wonder Woman Challenge would be a lighthearted way to showcase how much uncompensated work women still do — both at work and at home,” Curtis said. “It is unfortunate that we still need to be ‘wonder women,’ but we do, and we are. “This whole thing was about having a little fun and reminding ourselves that we do a lot, and we should recognize our strength and support each other as the ‘wonder women’ we are,” Stambaugh added. When Dr. Sharon Barnes, professor and chair of women’s and gender studies, heard about the challenge, she suggested including faculty and students, too. “The wonder women on the staff in our offices had this idea, and they ran with it,” Barnes said. “Personally, I’m not a fan of the sexually objectifying costume, but I like that she’s a strong, powerful woman doing good in the world. Those who accept the challenge are invited to stop by the Women’s and Gender Studies Office in University Hall Room 4260 on Halloween and have their photo taken by the poster. For more information, contact Curtis at linda.curtis@utoledo.edu or 419.530.2233. This entry was posted on Thursday, October 25th, 2018 at 3:00 am and is filed under Arts and Letters, UToday .